This definitely breaks out of the lineage created by the first four. There were a couple of characters that lived up at the top of this high-rise block in Toryglen who had just huge record collections. They'd see me in the lift with my albums on me and say: "Come up and hear this and hear that…" and I'd go up and hear all this new stuff and I remember one of these guys saying once: "You've got to hear this. It's Tonto's Expanding Head Band." That was the first time I'd even heard Moog and synth sounds. Then he said: "These guys have produced Stevie Wonder…"
Now, with Stevie Wonder, I always thought about the Motown stuff he'd done but always saw that as the kind of stuff you played at parties or heard at the school dance. I liked it but I never bought it, knew much about that culture and the lyrics just weren't for me. 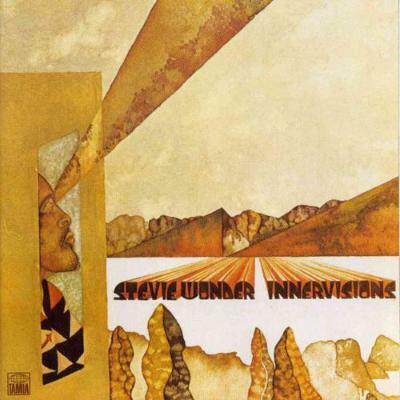 Innervisions on the other hand came in this period where Stevie Wonder was starting to write about what was going on in America at the time and this was the first opportunity I'd had to really tune into political writing in any great detail. That combination of fantastic tunes, the sounds, the synths and I guess the funkiness - all married to lyrics in songs like 'He's Misstra Know-It-All' where he's taking a stab at the government - definitely made for something I wanted to play… and play continuously. It was one of a few classic periods that Stevie Wonder had. He was having hits still, but there was a depth that wasn't there in the Motown period.